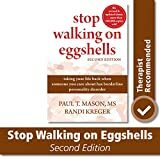 Stop Walking on Eggshells (Second Edition), is a book about borderline personality disorder ("BPD"). Coauthor Paul T. Mason, MS, is vice president of clinical services at Wheaton Franciscan Healthcare, in Racine, WI; coauthor Randi Kreger is an inveterate writer. In describing the book's genesis, in the "Introduction", Kreger explains that she began interviewing mental health professionals to learn what the partner, friend, or family member of a person with BPD or BPD traits can do to stop walking on eggshells, while continuing to support the person they care about. Congruent with that research interest, the book is laden heavily with thoughtfully practical suggestions, especially practical advice helpful potentially to partners, friends, or family members of persons with BPD or BPD traits. Substantively, the writing custom of Mason and Kreger is to mix deftly BPD centric anecdotal matter with germane discourse of a customarily informative and insightful nature. The book is styled in plain English. A multitude of snippets, drawn anecdotally from various persons, are grafted in an attention gathering and instructive way into the book's corpus. Mason and Kreger explain, in Chapter 1, that the "examples" in the book are culled from Internet support groups. The substantially anecdotal nature of the book's substance, from a critical perspective, dilutes its relative academic potency. There is some research referencing of the book's contents. There are also numerous textual fragments, extracted gingerly from specifically identified research materials, which add materially to the book's composition. But it may be noted, critically, thatvast swaths of the textual terrain are not specifically research referenced. In a structural section ("References") following the text, citations are provided for numerous BPD relevant research materials, alphabetized by author last name. Another structural appendage ("Resources") attached to the text gives citations for some research materials pertinent to BPD, and further gives information regarding some online resources and websites tethered to BPD. A critical evaluation of the discourse of Mason and Kreger is that they discourse on BPD at a relatively non scientifically advanced level. Critics sharpening their pencils may further write critically that many of the suggestions proffered by Mason and Kreger, in real life terms, are actually hard earned skills not learnable simply by reading a book. But for many readers, the writing efforts of Mason and Kreger may be generally helpful with regard to garnering some generalized knowledge and understanding of BPD. These efforts are manifested, structurally, by three structural "parts" comprised of twelve chapters. A pithily instructive examination of diagnostic criteria for BPD is conducted skillfully by Mason and Kreger, in Chapter 2. The crux of Chapter 3 is the search, by Mason and Kreger, for some understanding of BPD behavior. A "non-BP" is defined by Mason and Kreger, in Chapter 1, as a relative, partner, friend, or any other person who is affected by the behavior of a person with BPD. In Chapter 4, Mason and Kreger, exhibiting their characteristic informativeness and insightfulness, expound on how BPD behavior may affect non-BPs. Chapter 5 is suffused with thoughtful suggestions which, in a practical way, may be helpful potentially to non-BPs. The substantive contents of Chapter 6 likewise are replete with thoughtfully practical suggestions. Topics broached extend notably to issues involving "limits" and "boundary" issues. In Chapter 7, Mason and Kreger, acting with their customary thoughtfulness, dispense more practical advice, which may be quite helpful to non-BPs. The gamut of issues discussed in this context importantly encompass communications related skills. In the enframing substantive context of creating a "safety plan", Mason and Kreger, in Chapter 8, prescribe a further dose of advice, to non-BPs. In a characteristically thoughtful and practical way, non-BPs are counseled with regard to responding appropriately to rage, physical abuse, self mutilation, and suicide threats by persons with BPD. The substantive cynosure of Chapter 9 is protecting children from BPD behavior. In this overarching context, Mason and Kreger address a range of issues, and also offer numerous practical suggestions. The focus of Mason and Kreger, in Chapter 10, is directed sharply towards issues associated with children who may have BPD. In penultimate Chapter 11, the intellectual gaze of Mason and Kreger turns raptly towards "distortion campaigns" (including lies, rumors, and accusations), by persons with BPD. Making decisions concerning a relationship with someone with BPD particularly attracts the discerning attention, of Mason and Kreger, in concluding Chapter 12. In an Appendix following the text, Mason and Kreger comment tersely on biological and "environmental" risk factors associated possibly with BPD, and also on medication and psychotherapy (to treat BPD). In another Appendix, there is brief discussion by Mason and Kreger regarding "mindfulness", in the specific context of BPD; some "mindfulness exercises" are presented. Cautious readers may voice caution that every person who may have BPD is unique; moreover, every relationship with a person who may have BPD is unique. There may, as well, be sounds of caution that expert views may differ, regarding issues associated with BPD; and some experts may not agree with particular views put forth by Mason and Kreger, regarding BPD. Cautionary voices may add that Mason and Kreger have sighted a BPD landscape that may look quite different in the future. Not least, there may be critical concern that the book may be misused, by particular readers, as an inadequate surrogate for the expert counsel of qualified professionals. But Mason and Kreger have certainly shined an intellectually illumining spotlight on BPD, which may enlighten many readers, and may also help spark enlightening flames of increased public and professional interest, in BPD. Persons diagnosed as having BPD; undiagnosed persons exhibiting BPD traits; and persons with any type of relationship with someone diagnosed with BPD or exhibiting BPD traits certainly may benefit from the important contribution penned by Mason and Kreger. Mental health professionals, including clinicians and researchers, also may learn much from Mason and Kreger's edifying book.